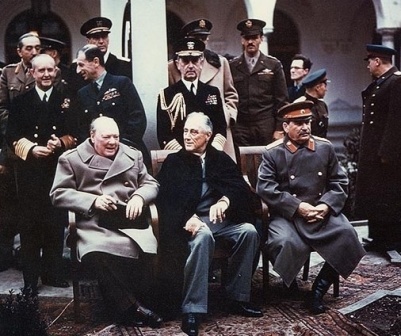 The “Grand Alliance” (to use Winston Churchill’s phrase) forged by the USSR, the United States, and Britain in the extreme conditions of war, was critical in upholding freedom and sovereignty of its member states and of many other nations all over the world. Germany, Japan, and their allies suffered a total defeat, and the territories they had occupied were liberated. The struggle against fascism brought together world leaders of seemingly incompatible political and cultural backgrounds. They were compelled to overlook their differences to protect human and democratic interests of their populations against the racist aspirations of fascism. In its turn, Soviet propaganda refrained from invoking its prewar denunciations of “bourgeois” democracy. In the war’s final phases hundreds of thousands of Soviet officers and soldiers, liberating European states, gained firsthand experience of the capitalist West, while their Western counterparts got to know real Soviet people and discarded some of the prewar stereotypes about the Soviets. However, deep political antagonisms, which had colored the relations of the Soviet Union and Western democracies in the 1920s and 1930s, did not go away entirely but were only subdued. The inherent hostility was generated by irreconcilable ideological differences and clashing national interests. With victory in sight, these differences quickly resurfaced. Having routed their common enemy, the victorious powers lost the unity of purpose that had held together their wartime alliance.